Gulfstream expects to deliver its last G450 in early 2018. Gulfstream Aerospace is ending production of the Gulfstream G450 as it launches its new G500 large business jet. The company plans to deliver its last G450 to a customer in early 2018. The $44.65 million G500 is expected to receive type certification in 2017 with customer deliveries to begin in 2018. The transition to the G500 is an important milestone. 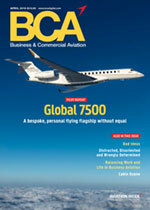 “The G500… flies faster, further, and carries more passengers and baggage,” noted Jefferies analyst Howard Rubel. The G600, a longer version of the G500 is expected to fly shortly. “We believe the program is ahead of schedule, and enables a seamless entry-into-service process,” Rubel wrote in a note to investors. Gulfstream has built more than 870 GIV, GIV-SP and G450 aircraft. The company will continue its fleet support. The G500 is in flight test with five aircraft in the test program. The first test aircraft made its first flight in 2015. The fourth test aircraft made its first trans-Atlantic flight in July. The fifth aircraft is a fully outfitted production aircraft that focuses on the cabin interior. The flight test program has amassed more than 1,600 flight hours. A G500 simulator is operational and in use at FlightSafety International in Savannah. The G500 will fly 5,000 n.m. at Mach 0.85 or 3,800 nm at Mach 0.90 and has a maximum operating speed of Mach 0.925. It will seat up to 19 passengers in three living spaces, include Gulfstream’s Symmetry Flight Deck with active control sidesticks, integrated touchscreen controllers and a next-generation enhanced vision system. It is powered by new Pratt & Whitney Canada PW814GA engines.